Coaching The Coach 2 follows the 2007 release of the number 1 best-selling football coaching book “Coaching The Coach: A Complete Guide How to Coach Soccer Skills Through Drills” which continues to sell thousands of copies worldwide. 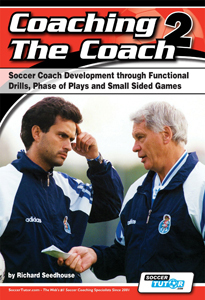 Coaching The Coach 2 - Soccer Coach Development through Functional Practices, Phase of Plays and Small Sided Games, the long awaited second book in FULL COLOUR, will help you develop even further. This is not just another book with lots of drills, it clearly shows how a coach can progress their practices and build training sessions. It provides more detailed knowledge in the form of coaching points as well as an understanding of why and how you can utilise them within functional drills, phase of plays and small sided games. This book provides coaching awareness and the realisation of how you can manipulate and adapt practices to coach and improve your players. Coaching The Coach 2 is written in the same popular easy to read question and answer format but is also much improved with very easy to understand new style 3D diagrams for all the practices. Coaching The Coach 2 will improve your knowledge, understanding and therefore your coaching. Richard Seedhouse 1st book, " Coaching The Coach" has been a phenomenal success. It has been the UK's number 1 best selling coaching book in the soccer coaching category since 2007 selling thousands of copies worldwide. He is a UEFA B license holder, JFO Tutor, author of 3 coaching books and also contributes articles and sessions to SoccerTutor.com and World Class Coaching Magazine. Very logical ideas how to approach soccer coaching challenges in an effective way. Fantastic read and fantastic service once again from SoccerTutor.com. The only place to shop for me again and again. They have everything you need to deliver and improve your coaching skills. Book is initially quite slowly proceeding from basic knowledge of coaching football to more advanced part of coaching. The latter part of book is valuable for more experienced coaches. Drills and SSG's shown are quite old and by using them you achieve slower tempo in training. Still the drills are good.